I'm not sure where the man spent his summer vacation, but by the looks of it, it might well have been at an Al Qaedq camp near Kandahar because Dominique de Villepin is one fearless crusader right now. Last we checked, Villepin was on his way to jail. With prosecutors preparing charges against him in the Clearstream affair, Sarkozy had beat his longtime rival once and for all. But no. 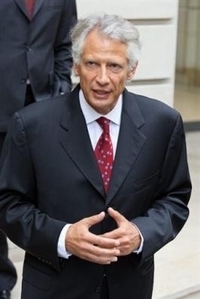 Villepin, this whole time has been writing another book on Napoleon: "The Dark Sun of Power". And since it's "la rentree litteraire" it's time to publicize the damn thing, and Villepin is doing the radio rounds and at each stop he skewers the Sarkozy presidency like the Socialists can only dream of doing. "I'm worried that the president is surrounded by flatterers," he said on France Inter. "I suggest everyone read and rerread the Bourgeois Gentilhomme by Moliere," he suggested, (insinuating that the new President is delusional and vulnerable to yes-men - if my third grade memory of the play serves me correctly). Does Villepin know his goose is cooked and whistling his way to oblivion? Whatever the case, bring on the crazy I say.